As 2008 is nearing its end, we've decided to say goodbye to it with this last post that bears the number 8 in its name. The year 2008, as the blog's first full year, has been quite good for Bookstore Guide - the number of bookstores in our database is growing constantly (although the pace has slowed down a bit), we have introduced some new features such as the Reports section, Top 5s, and added maps to the posts. Most importantly, the number of visitors is growing as well, and along with the emails we receive, it gives us a feeling that Bookstore Guide has actually managed to help or inspire some of you, which is what's keeping us going and motivated. That brings us to the title of this post - New Year's Resolutions. Of course, we would like to make Bookstore Guide even better in the next year and we have several ideas how to achieve this goal. There are still many cities which we lack and we would like to fill most of these gaps, so once again, don't hesitate with your recommendations. We're also planning to widen the scope of interest of our blog a bit, by adding a new section which would be focused on more general book-related issues and we hope to get some feedback from your side on the discussed issues as well. So stick with us in 2009, we'll do our best to keep you coming back. 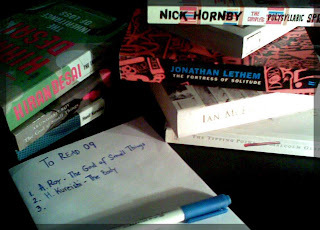 As for now, we would like you to send us any book-related resolutions for 2009, to inspire all of our readers... Just add a comment or email them HERE.